I am happy to announce that PP Stella Kan and PE Elizabete Fong were voted as Area 1 elected members of the nominating committee for District Governor 2017-2018 in District 3450. We welcomed our old friend Eric Ecowcill from UK Rotary District 1280. So happy that Eric is nominee for District Governor 2017-2018 in District 1285 , a new District to be formed in July 1, 2015. He gave us an inspirational presentation on how this year’s summer camp students were enjoying good quality time at Petty Pool camp. At the Camp, students took part in activities such as climbing and Abseiling, ultimately helping those students building self-confidence and team spirit. 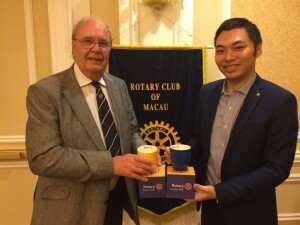 Here is the link from Rotary District 1280 which reported about the UK Summer Camp highlights of our two sponsored students Cherry and Ricky from Adopt-a-School St Paul School. http://www.rotary-ribi.org/districts/..
December 4(Thursday) – Regular Meeting postpone due to “Light Up Rotary Great Gondola Grab” event. December 11(Thursday) – Regular Meeting postpone due to Christmas Party. December 25 -28 – GuangXi Literacy and Poverty Alleviation Trip. Thank you and see you on Sunday at Venetian, 7th December, 2014 at 6:30pm.